Each play relies upon the witnessing abilities of others to set free the imaginative forces of resistance. Extreme Whether, written and directed by Karen Malpede with George Bartenieff, Di Zhu, Ellen Fisk, Jeff McCarthy and Kathleen Purcell. Photo (c) Beatriz Schiller. All rights reserved. For the past twenty-two years, Theater Three Collaborative has been producing ecofeminist-pacifist plays in New York and Europe, on a shoestring and against all odds. 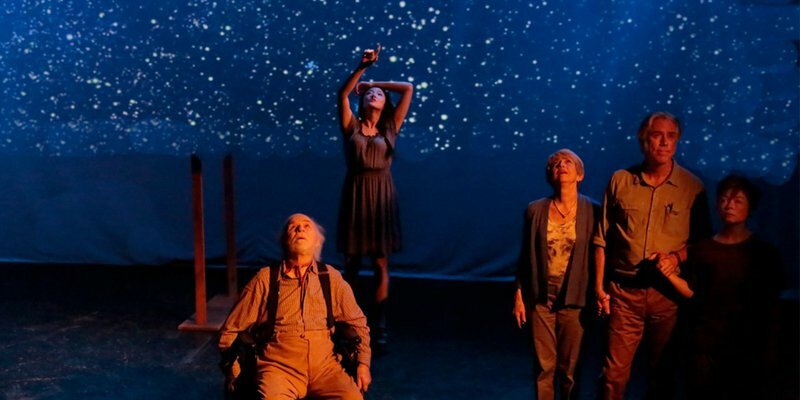 Now a book, Plays in Time: The Beekeeper’s Daughter, Another Life, Prophecy, Extreme Whether, documents this unlikely journey through four scripts, seven critical commentaries and 32 production photos. Our plays are character and story-driven, creating worlds into which the audience enters in order to experience the transformations of characters caught-up in the genocidal histories of modern life. Characters are not immune from fate—they might be raped or tortured, have committed a terrible war crime, been lied about and censored—but they resist the implications of their fates and find the resources to change their story through deep encounters with others who act as empathetic witnesses. Each play is full of moments of such turnings from despair to strength, and each relies upon the witnessing abilities of others to set free the imaginative forces of resistance. All theater, but especially a poetic-political theater, is about breath, language and body, since these are its tools and affects. As an actor’s breathing deepens, the language enters more fully into their bodies and this intensity transfers to the audience. Understanding of one’s own plight clarifies, memories rouse, and insights gather. We are alone but sit together in community. As each character’s stories touch individual members of the audience, a collective experience is generated. “The body keeps the score,” says trauma specialist Besel van der Kolk, meaning that the ills we suffer or inflict stay with us, determining our mental and physical health, blocking our way. The potential of theater is to reach inside the body to touch or dislodge a source of understanding or of pain. Sometimes in our work we see this happen. The Beekeeper’s Daughter, for example, is about a victim of the systematic rapes of Bosnian women who finds healing with the help of some eccentric American ex-pats. It was performed in New York while the war in Bosnia continued. The word got out and Bosnian and Croatian refugees to the United States came nightly; their welcome to their new country was enhanced by a play that told their stories to Americans in ways everyone might understand. Several refugee women and their families became our friends, sharing meals and holidays. Another Life, about the US torture program, begins on September 11, 2001. The mogul Handel watches the towers implode from his Soho loft and plots how to profit from the coming wars—he will found Deepwater, a private contracting firm based on Eric Prince’s Blackwater. While the play is fiction, its torture stories are real. We workshopped the play at the National Theatre of Kosovo, where our English-speaking Kosovar actors each had a private story of the torture of a family member or themselves to share from their own recent war. In New York, we learned from the actor who played Handel’s daughter that her grandfather had been tortured in China by the Japanese. A recent Iraqi refugee acted the role of Abdul, the undocumented Egyptian cab driver whom Handel makes his personal slave. He had seen the brutality of the American occupation up close as the tanks rolled into Baghdad, and had dodged bullets in the streets, caught in a firefight between insurgents and invaders. He had come through Egypt to the United States, and found in this play about the occupation and the torture camps an opportunity to speak his truth. He has since married an American human rights worker who first saw him on-stage in Another Life. They have a child. Ours is a completely improbable theater endeavor for New York in the age of hyper-gentrification, neo-liberalism, and endless war. I like to say our audience is comprised of people who long for the sort of live, communal experience that only the theater can provide, but who have given up on theater in general because it no longer speaks to them. We often surround our productions with what we call ‘Festivals of Conscience.’ These are post-play conversations between experts, activists and audiences. They allow audiences to hear about specific initiatives or to gain a deeper understanding of the issues. The Festivals of Conscience link the intensely private yet communal experience of watching a poetic play to a public dialogue about the redress of social wrongs. When Prophecy premiered in London in 2008, we hosted a packed post-play conversation between Israeli author Ilan Pappé and Oxford Professor Karma Nabulsi. When the play opened in New York two years later, antiwar activists and thinkers including Noam Chomsky, Chris Hedges, Laura Flanders and David Swanson dialogued with our audiences, which included theater parties from the ACLU, Peace Action New York, Code Pink and the War Resisters League. Pre-selling these blocks of tickets allowed us to fund the play. The first public reading of Extreme Whether took place in 2013, in the week in which Dr. James Hansen, America’s pre-eminent climate scientist, resigned his post at NASA so that he would be free to sue the government. He is an expert witness in the “Our Children’s Future” lawsuit being brought by minors in defense of the planet—his granddaughter Sophie among them. Hansen had already read the play, and had given me one note about it: “warming must be held far below two degrees Celsius.” He came to watch and speak to an audience of 150 people, and returned for the play’s opening in a staged production at Theater for the New City in the fall of 2014, just after the People’s Climate March had brought 400,000 onto the streets. Hansen’s talks, like most of those I’ve mentioned, are available on our website. Extreme Whether will be revived at LaMama in New York from March 1-18, 2018. Its story of the censorship of climate science is ever more pertinent today. So it is that we try in every way that we can to bridge the artistic and the social-political experience, for we believe that art is meant to give us strength and insight, and to mobilize our feelings and our thoughts so that we can bring nuanced understanding, depth and commitment to our activist lives.